Offering a premium overview of The Sky Blues, 2015 Futera Manchester City focuses solely on the lads from MCFC. The limited release promises one hit per pack and includes players from multiple eras of the club's storied history. The 2015 Futera Manchester City 50-card base set features a look at the current roster, including coaches, as well as former greats and future stars for City. Dropping 1:1.5 packs, Gold (#/16) and Platinum (#/8) parallels add a vivid finish and more scarcity. The main relic option, Memorable Memorabilia cards are numbered to 50. The 15-card insert features a horizontal layout with dual images and a game-used piece in the center. 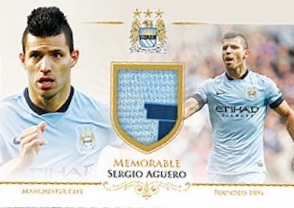 Part of a seven-card set, numbered to 35, Teammates Memorabilia cards combine two Manchester City players on the same card with a game-used relic for each subject. 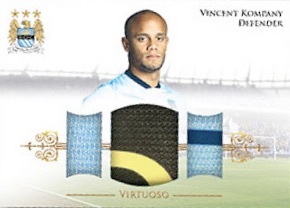 Finally, 15 Virtuoso Memorabilia cards continue the horizontal relic layout in 2015 Futera Manchester City. The multi-relic cards include three pieces of game-used or training-used gear and are numbered to 14. A regular inclusion in Futera products, The Mythicals honor the true legends for Man City with a gold-plated frame and real embedded diamonds. The three-card set is limited to seven copies. Finally, falling one per mini-case, 1 of 1 Printing Plates Production Sets include a printing plate card as well as multiple elements from the card's production. 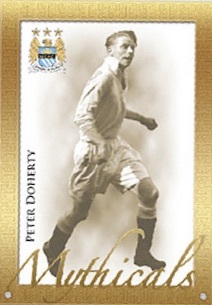 Although rare, there are also on-card autographs available in 2015 Futera Manchester City. They average around one per mini-case. 2015 Futera Manchester City has a limited production of just 15 cases (45 mini-cases) worldwide. Sealed packs and boxes are available direct from Futera. There is also a similar 2015 set from Futera that covers Arsenal. 3 cards. Serial numbered #/7. 14 cards. Serial numbered #/14. 15 cards. Serial numbered #1/1.